Single ply roofing systems use large rolls of waterproof materials joined together to form a single thickness of roof covering that can be applied over a variety of substrates and in a variety of attachment methods. These are typically light in weight, reinforced, and reflective for improved energy conservation and ecologically friendly application. Modified bitumen roof systems incorporate asphalt that has been modified with rubberizing or plasticizing additives to improve the weather resistance and flexibility of the asphalt. The asphalt is reinforced with polyester and/or fiberglas fabrics to give the finished roof strength and water resistance. The modified bitumen membranes can have numerous different surfacing options to provide resistance to fire, foot traffic , and ultraviolet light. The newer surfaces include highly reflective finishes to reduce heat absorption. These systems use the tried and true applications of hot asphalt and reinforcing felts applied in multiple layers to build the roof in the field instead of in the factory. Surfacing can vary and include gravel, coatings, and granular surfaced cap sheets. Metal roofing systems are usually made from galvanized steel, aluminized steel, or aluminum. The finished roof can have a mill (unpainted) finish or can have a factory applied finish in a wide variety of colors and levels of reflectivity. The metal can be formed into standing seams, through-fastened panels, metal shingles, simulated tile or simulated shakes, and can be installed on roof slopes from very low slope to very steep slope. 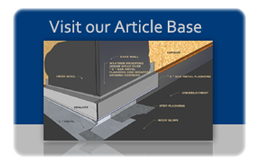 Its use is growing quickly and can be installed over a variety of structural building designs. These products are intended to salvage a roof that has reached a point in its life where it is still serviceable and not deteriorated significantly, but is beginning to show some signs of leakage and/or wear. Usually these applications can be installed at far less cost than replacement roof systems can be installed. There are systems designed for metal roofs, membrane roofs, and modified bitumen roofs. Each roof must be evaluated for its suitability for restoration. Would you really go five years without caring for your roof? It's just as crazy. Most people get a new roof and forget about it until it leaks or needs replacement. This reactive approach to roofing maintenance is analogous to changing the oil on your car after you have engine problems. By that time severe damage has occurred and an expensive repair is the only solution. There is a better approach; an S&S Roofing Maintenance Plan. Let our Qualified S&S Roofing Maintenance team will regularly inspect your roof, probe areas of potential problem, find and repair minor problems.